A former U.S. Forest Service hydrologist, Rosgen struck out on his own and started a private firm, Wildland Hydrology, in 1985. His mission is to repair rivers that have been dammed and straightened, restore streambanks that have been armored with riprap and gabions (think of shopping carts filled with rock), and revive overgrazed floodplains and streambeds mined for gravel. Rosgen embodies a new generation of river managers who champion “natural channel design” — the art of making rivers look and function like rivers rather than canals. During the last 15 years, over 14,000 hydrologists, engineers, biologists and ecologists from around the world have taken Rosgen’s courses. But not everyone is ready to follow this brash, righteous cowboy into the sunset. Some academics and consultants believe Rosgen is misleading the masses with an oversimplified approach to a complex field of science. “What is fluvial geomorphology?” Rosgen asks the class on the opening morning of his introductory course. “Fluvial geomorphology is the study of landforms shaped by water.” The 45 participants hail from almost every Western state, as well as Michigan, North Carolina and New Jersey. They represent federal agencies, state environmental departments, tribes and private consultants, and they’ve each paid $1,500 to be here. Over the course of five days, these pupils will learn the basics of Rosgen’s stream classification system, which uses a simple alphanumeric code (such as A2, C4, G1) based primarily on the river’s slope and the size of the gravel and rock in its bed. The system distills geomorphology, helping people to assess the health of streams and apply restoration techniques, which Rosgen also shares with the class. 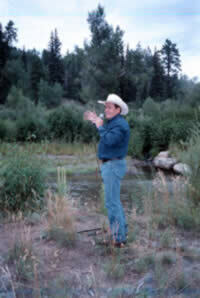 Rosgen first tried his approach on the East Fork of the San Juan River in southern Colorado, one of the stops on his course’s bus tour. Back in 1986, the East Fork was an overgrazed stream with a braided channel and eroding banks. 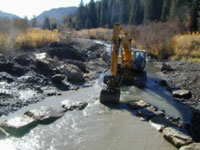 Rosgen restored the river to a single, meandering channel by using bulldozers and front-end loaders to arrange massive, native cottonwood trunks and quarter-ton boulders. Rosgen’s students recognize the project’s success 17 years later: Trout hide in deep pools and willows cover gravel bars. Visits to other sites like the Weminuche and scores of projects by colleagues and former students win over the class before the end of the week. Critics say Rosgen and his classes encourage messy saddles. An example is Uvas Creek in California, where, in 1995, a river manager tried to turn a braided channel into a meandering one. Uvas Creek had never been a meandering stream, and within four months of “restoration,” the creek had washed out, abandoned the single channel and returned to its braided wanderings. Scott Gillilan, a Bozeman, Mont.-based hydrologist who runs Gillian Associates, says such failures occur because Rosgen offers a “cookbook” approach to restoration. Gillilan and others resent the “disciples” who question restoration projects that don’t use the Rosgen system. Adding to the resentment is the fact that the Forest Service has adopted Rosgen’s method as its standard classification system. Nearly a dozen states require contractors to take Rosgen’s courses in order to bid on stream monitoring or restoration projects. Many critics recognize that the Rosgen classification system is a useful communication tool — and for now, at least, it’s the leading one of its kind. The author writes from Paonia, Colorado.